As soon as you lay eyes on J.K. Simmons in a shoulder-length silver wig, it will hit you: Long Haired Businessmen is serious about mocking serious business. Why else would a famous guy like Simmons be sharing screen time with journeymen comedians in this low-budget sketch? And most importantly, why are they all wearing wigs? 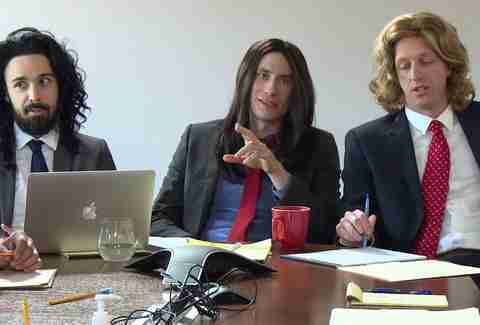 Produced by Funny or Die, Long Haired Businessmen is a short-form sketch series that’s been kicking around the internet for the past few years on various platforms before Amazon Prime began streaming it in early 2018. Very literally, it’s a show about businessmen with long hair that happened to land a big-time celebrity cameo in its Season 1 finale. But Long Haired Businessmen is also a reminder that the workplace comedy genre, since The Office went off the air in 2013, has been without an heir-apparent vehicle for slicing commentary on the dullness of American corporate culture. Will Long Haired Businessmen be the show that claims the swiveling, ergonomic, leatherette throne vacated by Michael Scott and co.? Or will it be Corporate, Comedy Central’s recent entry into the genre? Can any show be the show? Or as more millennials join an increasingly gig-ified economy, the middle class evaporates, and both blue- and white-collar jobs become less dependable, has business gotten so fractured, frustrating, and serious that no send-up of it -- no matter how incisive the commentary, or how luxurious the wigs -- can enjoy mainstream success? Until recently, a workplace comedy didn’t need prosthetic manes to distinguish itself as a worthy watch. Through the last century, the work of the American middle class was distributed across distinct industries, each with their own characteristics. From Taxi, to WKRP in Cincinnati, to Cheers, previous eras’ contributions to the genre were set outside the corporate sphere -- not as a novel rejection, but as a reflection of the diversity of real-life labor undertaken by its viewers. As the American workforce swelled with an influx of college-educated Baby Boomers in the ’70s and ’80s, innovations both technical (personal computing, et al.) and cultural (second-wave feminism and a broad surge of careerism) gave rise to a new type of work in the American collective consciousness: the office job. But even as workplace comedies like Designing Women and Murphy Brown, which was just rebooted, were set in more corporate environments, they still mostly made the case that friendship, variety, and fulfillment were attainable in American office life. Then the ’90s and early aughts came, bringing record-setting income inequality and cataclysmic instances of corporate cynicism. Apprehension about corporate standardization and global trade elicited physical clashes like the Battle of Seattle, and spurred cultural opposition in art, music, and popular media. Fight Club and Office Space both came out in 1999. The coincidence aptly punctuated a new mood about corporate office life: that it was antithetical to personal fulfillment for American workers. The Office hit American air in 2005, and in many ways, it was perfectly calibrated to channel contemporary corporate malaise. Here was a workplace comedy built not on affinity, novelty, or aspiration, but on the bleak, unremarkable discomfort of American professional life. The show’s unrelenting portrayal of an antiseptic and mind-numbing workplace resonated with a new crop of pessimistic Americans destined for white-collar jobs. Yes, the breakout cast, popular theme song, and built-in opportunity for smugness it conferred on anyone familiar with its British predecessor all helped. 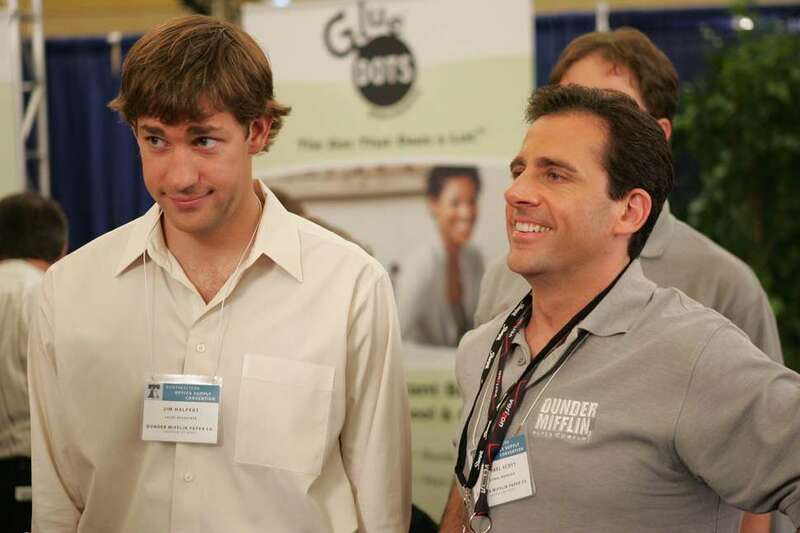 But The Office’s success is best understood as a function of how well it reflected the wretched professional unfulfillment of corporate work while still suggesting that characters could achieve some measure of happiness. The workplace comedy is dead as we once knew it. Shows based on unique job environments (from Taxi to 30 Rock) feel escapist, while those built atop optimism and aspiration (from Cheers through The Bold Type) seem downright unrealistic. For a show to succeed in this genre, it must weaponize The Office’s piercing disenchantment with corporate life more aggressively than that show ever did, and resist the temptation to soften that cynicism with comforting familiarity. In other words: no real-world references, no hopeful allegories, and maybe most importantly, categorically unlikeable characters. It’s a tall ask, and unsurprisingly, there haven’t been many notable attempts to answer it. But there are a few. Consider two recent entrants into the genre: Long Haired Businessmen, and Corporate, picked up by Comedy Central for a second season this past summer. 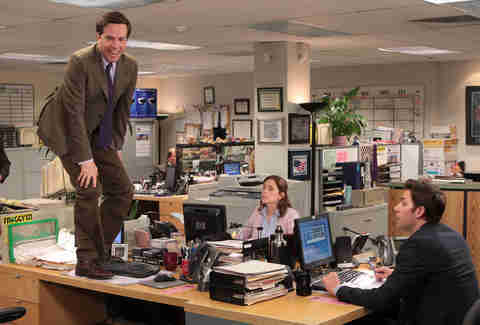 The two shows vary in format, scope, and style, but both clearly attempt to portray American office life with unsparing bitterness. Only one does it well. Corporate fails for the same reasons that Long Haired Businessmen succeeds. LHB is a merciless portrayal of American office life, but it’s not a humorless one, unlike Corporate's despairing and soulless mega-corporate setting called Hampton Deville -- an obvious amalgam of real corporate behemoths like Apple and Amazon -- relying on dreary plot devices (suicide scenes, nightmare sequences, etc.) and composition that winds up coming off as gloom for gloom’s sake. LHB, for one thing, has the playful absurdity of the wigs. Celebrities who make cameos, like J.K. Simmons and J Mascis of Dinosaur Jr., are not exempt from participating. The wigs have no relevance to either the plot nor the characters; they’re never explained or even acknowledged. That visual gag sets the tone for the entire show. Divorced from distinguishing context and unburdened by likable characters, Long Haired Businessmen is able to ruthlessly lampoon the infuriating and intangible purposelessness and hypocrisy of corporate culture. The show rejects even vague references to reality, focusing on an unnamed company conducting unknown (and therefore irrelevant) business, managed by "team leaders" who have no clear team or leadership responsibilities. The featurelessness of plot and setting -- amplified by the low-budget style in which it’s filmed -- powerfully lays bare the utter banality of what happens on screen. The main characters (played by George Kareman, Pat O’Brien, and Ben Wietmarschen, the show’s creators) are like Bill Lumberg’s idiot failsons. They are arrogant, inept morons without an ounce of self-awareness between them to make them less flatly loathsome. The characters’ interpersonal dynamic is cruel and congenial in a way that’s totally disquieting. They don’t empathize with one another, not because they dislike each other, but because they each seem incapable of doing so. In two of the seven episodes currently streaming, they attempt to fire employees for incomprehensible reasons, only to rehire those same employees in the very same conversation. Crucially, there is no hope in Long Haired Businessmen. There is no optimism for the world beyond these partitioned walls. Occasionally, dialogue will focus on their personal lives, but only to reveal those lives as nonsubstantive, loveless, and toxic. Beyond that there’s nothing: no news cycle, no geography, no motivation. Time does not seem to move linearly, but neither does the plot rely on devices like flashbacks to explain its non-linearness. It all just sort of exists at once. You get the sense that the long-haired businessmen would be toiling at their unspoken Sisyphean task even if there was no show about it; even though it makes them feel empty; even if it doesn’t matter to anyone. It is, frankly, the perfect workplace comedy for the grim present tense of American professionalism. Plus, those wigs are truly hysterical. Dave Infante is a journalist in Charleston, South Carolina. Follow him on Twitter @dinfontay.